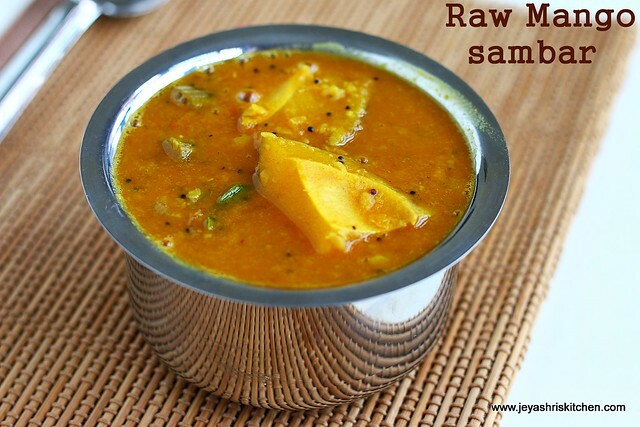 Mango Sambar | Raw Mango sambar i have tasted in my friend's house few years back, but somehow i didn't liked it. But i don't say she didn't make it nice, because mango sambar one of her signature dish. Somehow i don't like the tanginess of mango in sambar. Later my sister was insisting me to try out the maanga murungakaki sambar, and i told i am not a big fan of maanga samabr. But later i made up my mind to try out this sambar recipe and finally i liked the sambar very much, The recipe of maanga sambar which my friend gave was bit different than the usual way of making sambar. So i sticked to the usual method of making sambar. 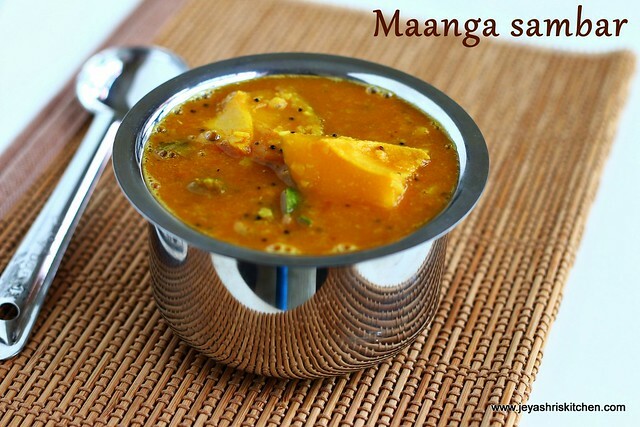 Try out this mango sambar in this mango season and let me know how it turned out. Cook the toor dal with enough water and add a pinch of turmeric powder while cooking. Soak the tamarind in hot water for 5 minutes and extract the juice by adding 1 and 1/2 cup of water. Let the tamarind extract be thin. 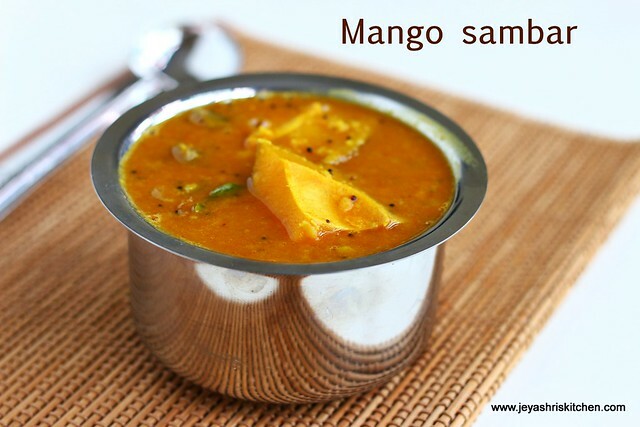 Since the mango gives tanginess to the sambar, let the tamarind water be thin. In a pan add oil and throw in the mustard seeds and add the peeled shallots. Cook it till it becomes golden . Add finely chopped tomatoes to this and cook till it becomes mushy. Add in the chopped drumstick to this. Add the tamarind extract and add the salt, sambar powder, asafoetida and turmeric powder. Cut the mango with the seed intact. A normal sharp knife will do this. I used the round mango, you can use any variety. If you feel it is difficult to cut the mango with seed or sometimes if the mango has hard seed, just slice them into big cubes, without peeling the skin. When the drumsticks are half cooked, add the cut mangoes to this. Mangoes tend to cook soon, so we are adding this in the middle. Cook for few mintues till the mango gets cooked. Do not over cook, let it be firm. Add the cooked toor dal to this. Before adding mash toor dal nicely. Add water to get the right consistency. Allow this to boil for 2 minutes in a low flame. Switch off the flame and add curry leaves. Sambar is ready to serve. Serve with hot rice and any Dry curry of you choice. Since mango and tomato are there do not add tamarind in the same quantity as we add for other sambars. You can add 1 gren chilli or red chilli while tempering the mustard seeds. Few slices of brinjal can be added to the sambar while adding the drumstick.